At the moment I have a real craving for any kind of patterned top. Colour and pattern for me are a bit of a challenge, to put it mildly. But this basic boxy shape is very much my style so it makes the thought of wearing a bold print or pattern much less daunting. My usual day to day uniform consists of plain basic T-shirts and jeans so the fact that these are such a simple shape I think they would still go with everything I already own. I've been stuck in a bit of a style rut lately and I really want to try some new things and you could see even with the smallest of glances that colour and pattern are the two most absent things in my wardrobe. 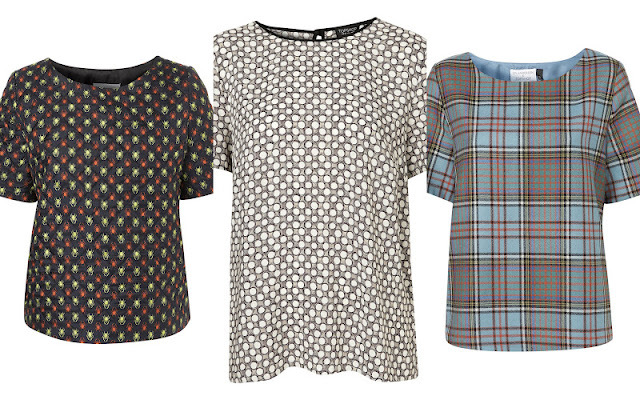 It is complete coincidence that these three tops are all from Topshop. Even more so that two are from the newly released J.W Anderson x Topshop collection. I had gone off Topshop a bit the past season or so but I really like what they have in at the moment. Now if only they where just to lower their prices I might actually shop in there again!